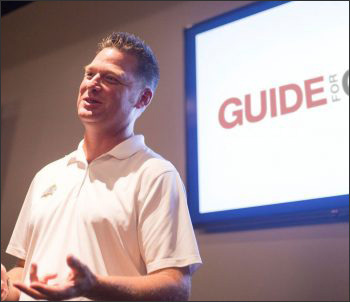 Chad Johansen’s story is one that resonates with golfers and business professionals alike. Chad grew up in small-town Illinois, where he committed himself to the game of golf and honed his craft until he was within a few short steps of the bright lights on the PGA Tour. It wasn’t easy, and the lessons he learned along the way — about both golf and life — helped him find his passion of teaching golf, helping kids and growing the game. Now, Chad pursues that passion while maintaining his status as an innovator in his field. That’s the message he can give to your guests. Chad believes students learn through experience. That means more direct play and actions from the student and less talk from he instructor. His expertise in using video analysis allows him to compare what his students “think” is happening with what is really happening. He uses modified golf techniques and gives students immediate feedback so they can see real-time changes. Now, his methods are being adopted by players on the PGA Tour. Chad’s hands-on presentation about life, golf and business will entertain any employee, guest or client. If you are looking for a memorable treat for your audience, contact Chad Johansen to schedule a time today.